An Italian spring risotto makes an elegant entree or interesting side dish for guests and families alike. Add it to your dinner repertoire when asparagus is young, in-season, and available at your farmers market. Choose a thin variety of the veggie to assure both tenderness and doneness when incorporating it into this simple rice dish. Then, pair it with the subtle spice of shallots and the salty finish of a parmesan risotto cheese sauce for a dish that celebrates a long season full of fresh, just-picked produce. Vegetable risotto recipes are easy to prepare and don't require a laundry list of ingredients. If you don't care for asparagus, sub broccoli florets or fresh spring peas instead. Either way, make sure to add the vegetables toward the end of cooking to assure a slightly firm, al dente result. And if you like this fresh dish, make sure to try our list of other vegetarian options—chock-full of produce—that will take you through the spring and summer growing seasons. In a medium stockpot, heat the vegetable broth until it's hot. Then, reduce the heat to low and keep it warm until you're ready to use it. In a large Dutch oven or soup pot, heat the olive oil over medium heat. Add the shallots and sauté them for 2 to 3 minutes, until translucent. Add the Arborio rice and stir to coat. Add the white wine and bring to a simmer, cooking until all the liquid is absorbed. Add one cup of the vegetable broth. Stirring constantly, allow the rice to cook for 3 to 4 minutes until the broth is dissolved. Continue in this fashion, adding broth and stirring, one cup at a time until you have only one cup of broth remaining. Add the chopped asparagus to the pot along with the last cup of broth. Cook for a remaining 3 to 4 minutes. If the rice is still crunchy, add more broth, 1/2 cup at a time, until it reaches the desired consistency. 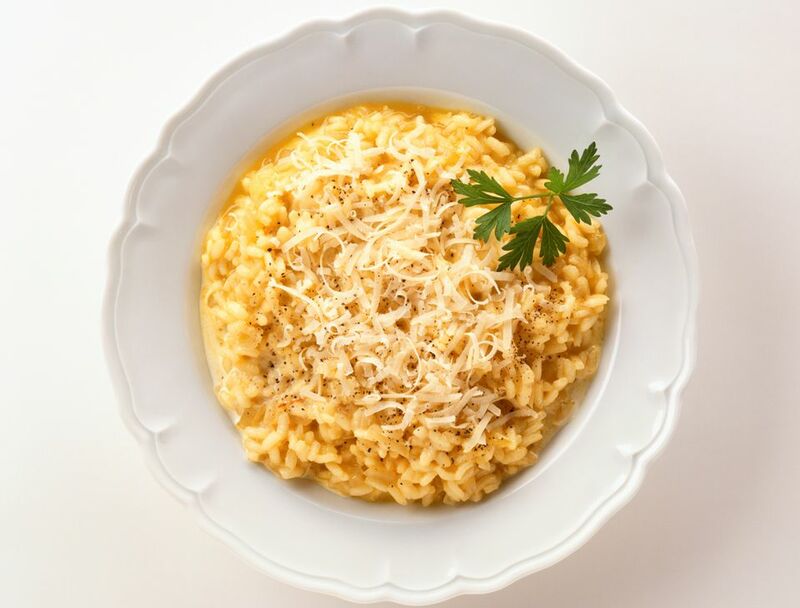 Remove the pot from the heat and stir in the parmesan cheese until it melts into a risotto cheese sauce. Add salt and pepper to taste. Sprinkle with additional cheese (if desired) and serve. For other spring and summer risotto recipes, try the rich flavor of this porcini mushroom risotto. A mid-summer spicy red pepper risotto uses a favorite nightshade to add a sweetness to this rice dish. And a vegan pumpkin risotto provides the perfect comfort food to segue you into fall.